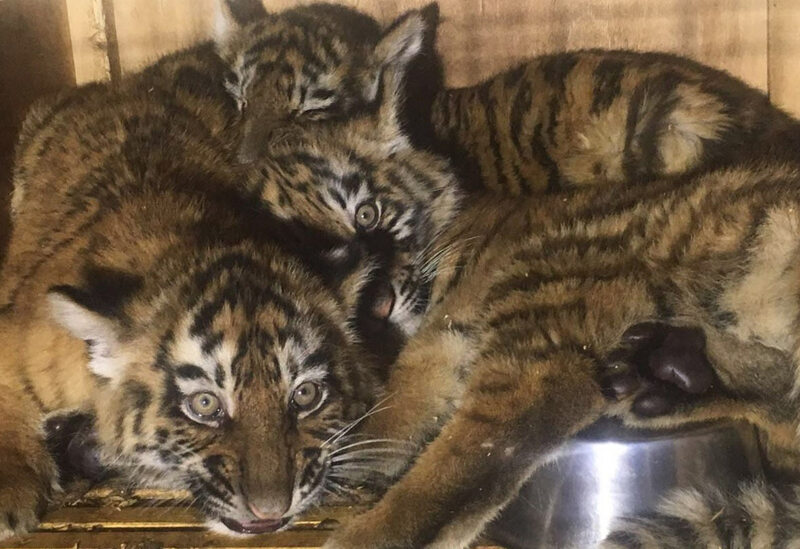 THREE baby tigers stuck at Beirut Airport for SEVEN days in SHOCKING conditions! We have been working with Ministry of Agriculture for years - the animal protection and welfare law, joining CITES, and recently a decision to stop the trafficking of big cats and ban them from being kept as exotic pets or in private zoos. Despite all of this, photos of lions, tigers keep showing up on social media and more reports of them being in private hands, and others coming into our care. As soon as we were alerted about the shipment of baby tigers arriving to Beirut Airport, we alerted the Ministry of Agriculture and Customs. These endangered animals landed on Tuesday, 7 March at 7:00 pm. Ministry staff went to the scene to the airport to check the shipment. Owner presented paperwork showing that these baby tigers are going to Syria and not Lebanon and he presented CITES permits for Syria. He also said that their flight is next day at 6 PM with ShamWings. Three days passed and baby tigers still stuck in their so called crate. ShamWings employee stated to us that they don't have ventilated planes for live animal transport. Seven days passed and tigers remained in a closed box - The welfare of these animals was in question and there were serious concerns about their conditions locked in that box. We had to act and we went to Judge of urgent matters of Baabda Mr. Hasan Hamdan asking for immediate confiscation of these tigers to help them survive. Tigers are now safe thanks to Judge's order. At the airport, many people expressed their shock once they saw the crate and how the animals were being transported. It is not acceptable in any sense to transport any animal in such box! Everything from the basic construction of the cage to inability to clean or have absorbent bedding, to inappropriate size, and no proper installation for food or water bowl. The crate was too small for the animals to even stand, and the bottom of the crate is covered in hundreds of maggots. Both CITES permits state that the permits are only valid if the transport conditions comply with IATA Live Animal Regulations, and this cage certainly does not comply, therefore the permits are not considered valid and should never have been accepted in Ukraine or allowed further transport. Thanks to the cooperation of Ministry of Agriculture, customs and airport security, we were able to highlight this case and prevent these animals from suffering further at the airport. NOW WHAT IS THE FATE OF THESE BABY TIGERS?